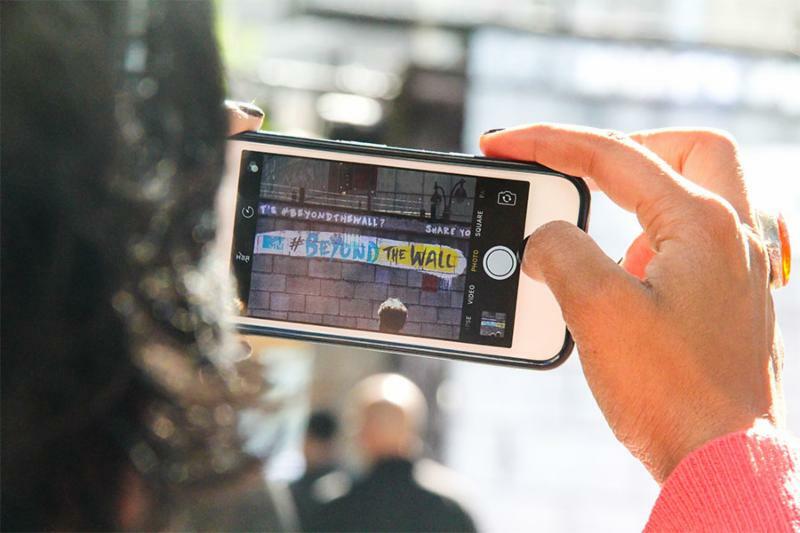 On October 10, 2016, South Asian Americans Leading Together (SAALT) partnered with MTV and several other organizations on a groundbreaking project called “#BeyondTheWall”, a 10’x35′ interactive video installation standing in the heart of New York’s Herald Square that serves as a digital forum to showcase perspectives on immigration reform, racial diversity, and multiculturalism in the United States. The video wall, metaphoric of the much debated border wall of the 2016 elections, provides visitors an opportunity to see video stories from participants such as Diane Guerrero, Arturo Castro, Amani Alkhat, and Cristela Alonzo, along with real-time user-generated submissions over social media, about how immigration and diversity are at the heart of the American experience. With October 10 marking Columbus Day and Indigenous Peoples’ Day, a reminder of the nation’s multicultural origins, this curated interactive forum provides in-person and online audiences a way of listening and adding to the ongoing discussion about immigration and diversity in the US, a central issue in the 2016 elections. In the run up to the elections, SAALT has released YOUR VOICE YOUR VOTE: A Guide for South Asian Voters, which provides key election deadlines and resources, South Asian voter priorities and data, as well as the policy positions of the two main Presidential candidates. One such priority for South Asian voters is immigration reform. Recently, the Supreme Court declined to rehear arguments in United States v. Texas, effectively denying millions of immigrants and over 200,000 South Asians the benefits of the Obama administration’s 2014 executive actions of Deferred Action for Parents of Americans and Lawful Permanent Residents (DAPA) and the expansion of Deferred Action for Childhood Arrivals (DACA). SAALT’s Immigration Factsheet, available here, explains the current state of the law and provides key resources for those wanting to learn more. 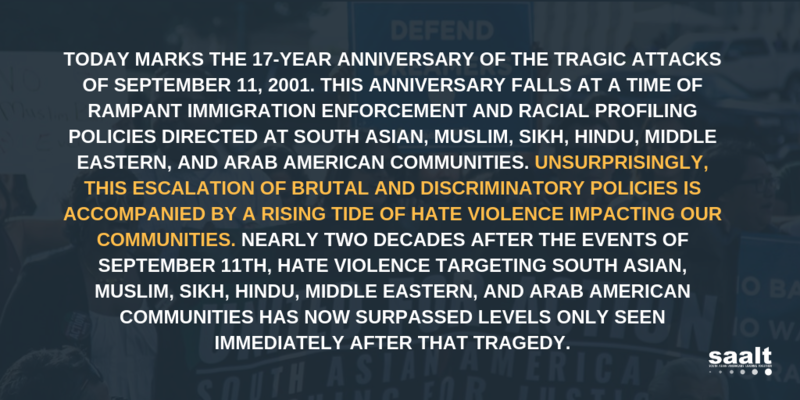 With immigration reform and racial diversity at a high pitch in both the public and political spheres, and with hate violence and xenophobic rhetoric continuously affecting the South Asian community nationwide, the #BeyondTheWall project provides an opportunity for all of us to speak, listen, and engage in a meaningful conversation about the ideals of this country, and how to perhaps one day reach them.